Hello and God's blessings to you all on this wonderful Monday! (though technically, I'm posting this late Sunday night.) We are incredibly smoky up here in Tok, Alaska with 3 different forest fires within 60 miles or so of us. We are praying that we get two good days of rain to knock the fires out, but it's not looking too promising on the forecast. 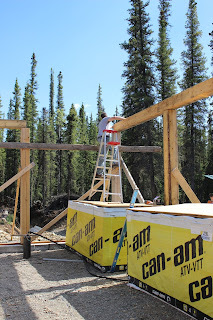 I thought I'd give you an update on the house and tell you some of the fun stuff that goes along with building in Alaska. In most places in Alaska (those that are not in boroughs, primarily) there are no such things as codes. You are not required a gazillion permits to build your house or even one. You do not need an inspector to tell you your house is approved to live in. 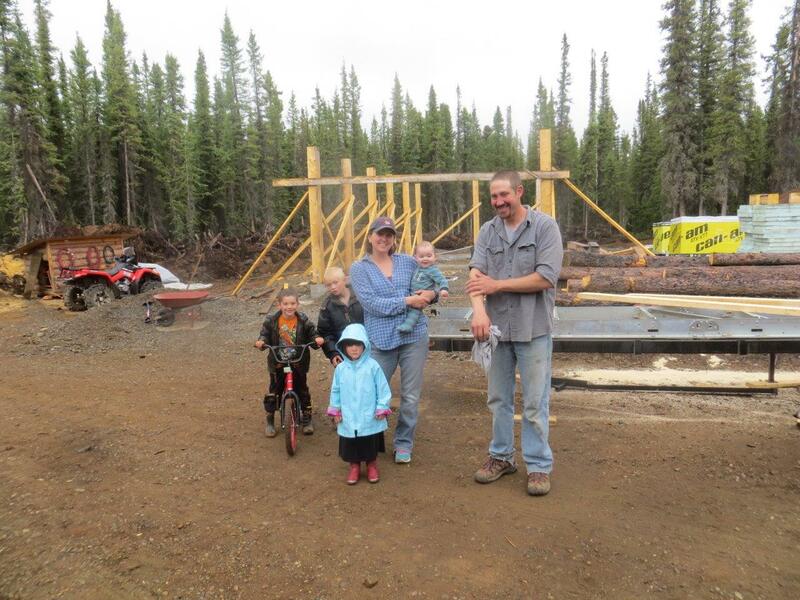 In fact, most people live in their house while they are building it (so we aren't too crazy...in Alaskan terms.) You don't need a contractor, plumber or any other profession ending in 'r' to legally build your house. You don't have any local, state or federal agency breathing down your neck and peeking in your pipes. With this are goods and bads. You can build things the way you want. When we lived in Oregon, if you sneezed wrong you got a ticket from the building inspectors that would troll the streets in search of home improvement. We are building a house that is not traditional with extra layers for insulation and whatnot which might not be considered "legal" in other places. Here, Stretch can use ladders on top of four wheeler crates topped with plywood and contortionism to put up beams. This maneuver is not OSHA approved. You can live in an unfinished house. Now, why is this important you may wonder? Well, for us, we want to build our house completely out of pocket. When we are done, we want no debt. In order to achieve that goal, we are going to have to build it in stages. Since we also don't want to pay the crazy rent prices that are in Tok, so we can have the money we need to build the house, we need to be able to live in our house during those stages. So, stage 1 for us is the 16 x 40 section of the house that will eventually be the garage. 16 x 40 section we are building this summer. You can see the rest of the perimeter of the house in the background. You can actually build your house for a reasonable price. My brother-in-law built a house a few years ago and paid over $30,000 just in permits! That's bonkers! We are thinking, if we don't go crazy, that in the end our house will cost around $40,000. Translation: no mortgage! We won't have an electric bill since we will be on solar. We won't have a water bill since we have a well. Imagine what you can do for God if your major bills coming out of from your income didn't exist! We are actually going to be able to build our house all on our own (with the help of our awesome friends from time to time) from the concrete to the roof and all the layers in-between. Can you imagine how satisfying it is going to be to drive into our property in the years to come and say, "We did this!"? Sometimes I feel like the people of ages gone by, responsible for creating your own way on the frontier, not expecting others to do the work for you, but being thankful for the help when you have it. If you don't know what you are doing, you could end up with a house like in my Manic Monday #3 post. When you are shopping for a house in Alaska, it is very important to know the tell-tale signs of a builder who cut too many corners or didn't have a clue. 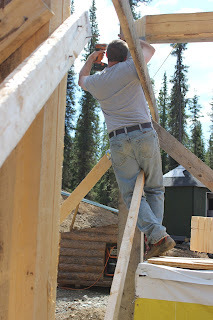 Muscling a beam into place with leverage and balance. Getting a mortgage can sometimes be tricky. And getting a building loan as well. So, in the future if you ever wanted to sell, you have know the things that mortgage companies won't approve and either build with that in mind, or plan to never sell. I know, there are probably other bads, but I honestly can't think of any, when it comes to building. Which is one of the things that appeals to us about Tok and other rural parts of Alaska. Just imagine, in 2-4 years, depending, we will have a house on over 3.5 acres that we built with our own two hands and with no mortgage. Add to that the opportunities to hunt or fish all the meat we will ever need and if we maintain a yearly garden, expenses go down even further. Yes, we pay more for some groceries and other things, but honestly, this last winter gas was cheaper here than it was in Las Vegas and last time I went to Colorado to visit family, groceries were very similar in price. All this to say, living in Alaska is awesome, and I'm blessed to have the freedoms we have by living here. Hope you have a manic one! Really great story! We are doing something similar. We sold our house and paid cash for a real fixer upper. Used the rest of the money for the major fixes, i.e. roof, plumbing, electric. Sure we haven't had counter tops for 2 months but we make do with our tables. Yep, that no mortgage thing is a great feeling!